Trainer Leah Epstein and Gold Standard, aka Bravo, at Ithilien Stables. The lines of the Leonard Cohen poem drifted across the indoor arena on a cold morning in Northern New Jersey. Each verse was punctuated with a breath of exertion as Leah Epstein, the woman reciting it from memory, posted the trot on the horse she was training underneath her. Around her, a pair of her clients at Ithilien Stables, the hunter-jumper barn of which Leah is the proprietor and trainer, practiced shoulder-ins at the walk at her instruction, trot and then canter, warming up their horses to the tune of Leah’s recitation. 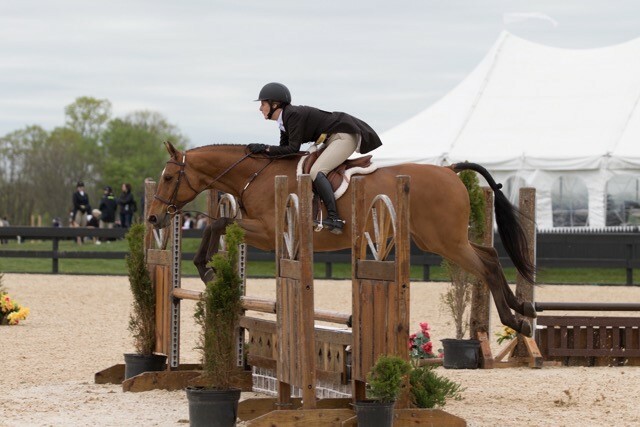 Sarah Maslin Nir and Trendsetter competing in a National Hunter Derby at Princeton Showjumping in New Jersey this summer. Passion and persistence are as much underpinnings of Leah’s meticulous teaching style as poetry and prose. Her unique pedagogy is a combination of top-flight basics and penetrating observations of the equine mind. The occasional lines of verse are just one of the many tools in this instructor’s toolbox. 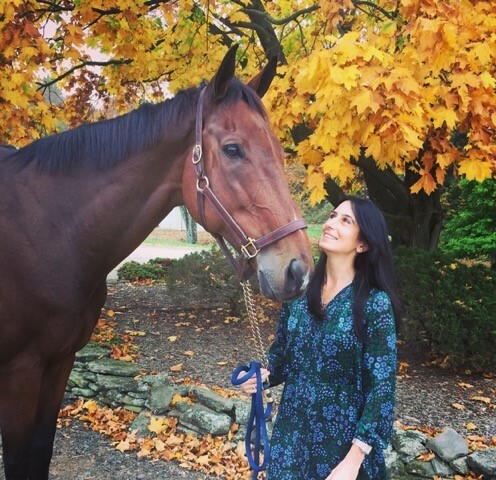 Her approach reflects her unusual background in the horse business — Leah, 40, studied art history at Cornell University, inspired by her parents who instilled the value of a college education, before she entered into the horse business full time 18 years ago. But it also has been crafted over time to cater to the clientele who are drawn to her: Ithilien Stables is in White House, New Jersey, a 45-minute drive from New York City. As such, the barn is full of the sort of professional women — such as lawyers, writers, those who work in the medical field and the retail and fashion industry — for whom Leah’s penchant for drawing of parallels between the modern hunt seat and her historical studies of the riding tribes of the Mongolian steppe (to use a recent example) keep the sport vital and engaging. 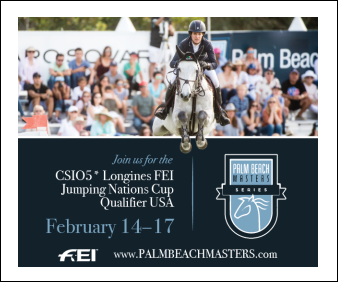 The facility is the former American home base of the New Zealand Olympic show jumper Kirk Webby and his family; Ithilien Stables began here as Kirk’s tenants, a collaborative relationship that now means some of Leah’s string are his former show jumpers. 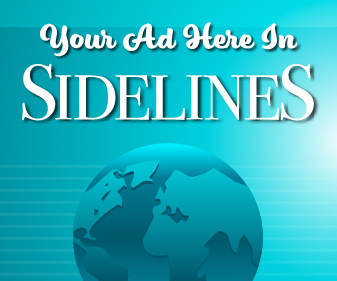 It’s now owned by Someday Stables. 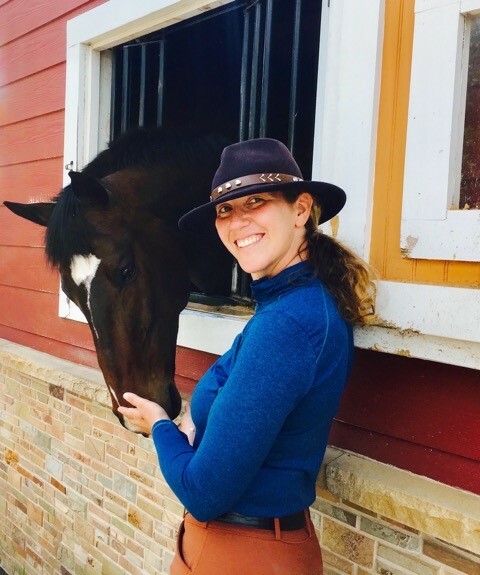 Sarah Trent leads a busy life as a lawyer, but finds balance at the barn and with her horse. One of those students is Sarah Trent, a lawyer from Manhattan who represents people charged with serious crimes who are unable to pay for legal help themselves. “My job and my soul are about helping poor people, but what enables me to keep my drive to do the job — because it is very emotionally demanding — is that I have something to balance that with,” Sarah said. Frequently, at her job, Sarah draws the unlucky straw for a late shift in Manhattan’s night court; when that happens, she makes sure to spend her free daylight hours at the barn, where devoting all her concentration to perfecting triple combinations, and how to execute that seconds-saving jumper turn, she says, steadies her soul for the night’s work to come. “The balance between both is what lets me excel at both,” Sarah said. “Riding is a present-tense activity” is an adage Leah has coined, and repeats often. For her, it explains why it’s such an appealing sport for Type-A people. Leah trains at all levels, but the drive her students have in their workplaces continues into the show ring. This year Sarah will be moving up to the Low Amateur Jumpers with her new horse Beach Boy. 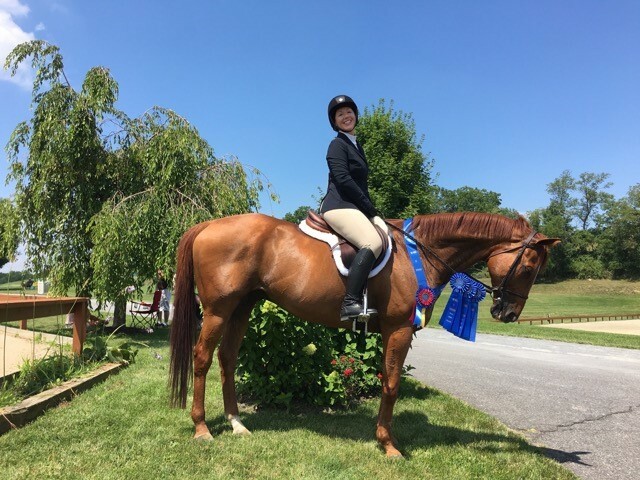 The author of this article began here as a timid 2’3” rider, whom Leah has elevated to qualifying for Zone 2 Finals in Harrisburg in the adult amateur hunters with her eye now on the 3’6” amateur owner hunters. Two-time Pulitzer Prize-winning journalist Jo Becker finds her zen at the farm. “When you’re on a horse, you’re completely present,” said Jo Becker, a New York Times reporter who won her second Pulitzer Prize this spring. She celebrated with a day at the 32-acre farm, playing with her favorite lesson horse, a grey German Warmblood with Bambi-like eyes named Newburgh. “You’re not thinking about work; you’re not thinking about your story that’s hanging over your head,” she added. Several of Leah’s clients work in the veterinary and medical fields as well as personal training. The presence at her farm of women who are experts in healing animal and human bodies, she feels, is the highest endorsement that she’s doing something right. 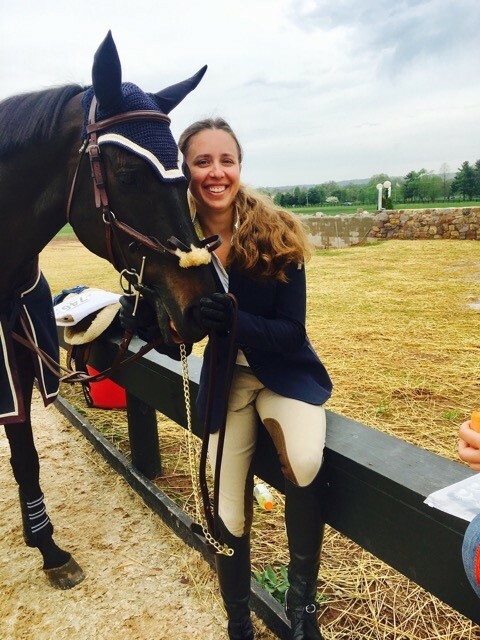 Gia-Raquel Esposito, yoga teacher turned equestrian on Chance Of A Lifetime, one of Ithilien’s school horses, at a recent competition. “She’s got an intuitive sense of how to communicate with people on different levels, no matter their background or level of experience,” said Gia-Raquel Esposito, a professional yoga instructor who returned to riding almost two years ago for the first time since she was a teenager. As she spoke, her Dutch Warmblood, Axel, a light chestnut with a flaxen mane and tail, stood beside her in the wash stall, quietly begging for treats with his eyes. “Even so, Leah always has to remind me to breathe while I’m on the horse,” said Gia-Raquel. “It’s always really funny — ‘Breathe, Yoga Teacher! Don’t forget!’” she said with a laugh. 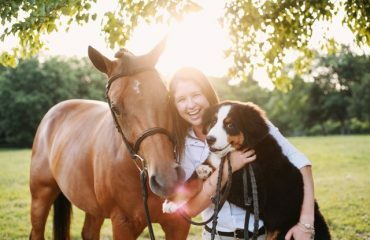 One of the ways Leah strives to make riding more affordable for her professional working clients is with horses that others may overlook. 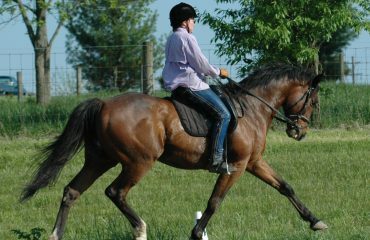 She specializes in senior horses, mounts who are often cast off for younger animals. 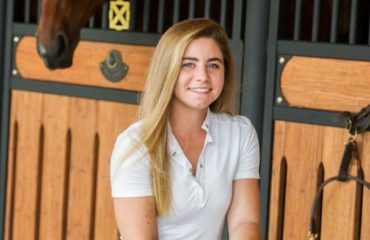 Leah believes that senior horses are under-appreciated gems that with love and investment in feed and maintenance, can be stalwart teachers who help riders grow. Plus, they are, she says, among the safest rides for her teenagers and younger students. 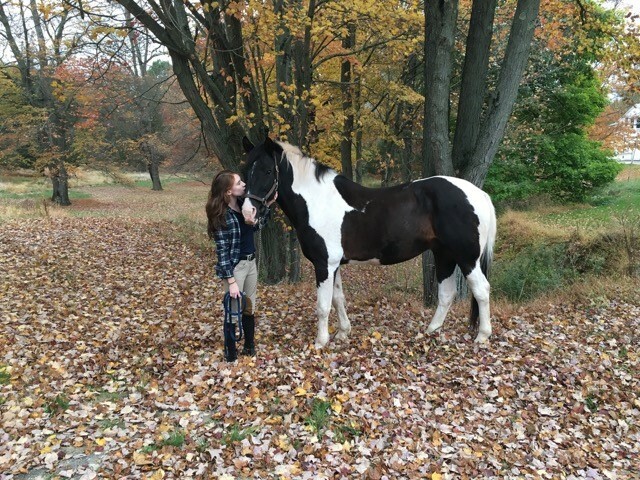 Jessie Lochrie takes time to unwind with her favorite school horse, Trystan. Lessons at Ithilien Stables may include Shakespeare sonnets or treatises on falconry. But they also include groundwork gleaned from Leah’s past equine studies in the United Kingdom, alongside flat-work infused with the tenets of classical dressage. Riders may get treated to an impromptu reading from the novel Leah is writing while tacking up in the cheery red barn, or an invitation to a town hall meeting in the neighboring town of High Bridge, where Leah is active in the local political community. Sharing a background as working professionals has created a tight-knit community among the riders at Ithilien Stables. 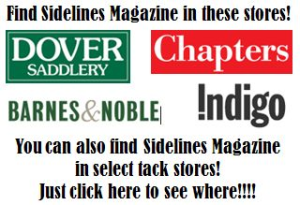 They take advantage of the fashion styling skills of Jessica Walker, a district manager for Banana Republic who owns Arkansas, a bay Thoroughbred as tall as the barn rafters, or ask Gia-Raquel for a tack room lesson on perfecting downward dog. Riding for many is a girlhood dream that hard work and Leah’s cost-saving strategies have at last made accessible as adults. Several equestrians here said that their hard work to earn the privilege of riding has turned barn time into an almost sacred part of the week. After the tack is clean and the horses are happy with their hay on summer evenings, it’s not unusual to find several riders having wine and cheese atop a wool cooler-turned-picnic blanket. It’s a hard place to leave. 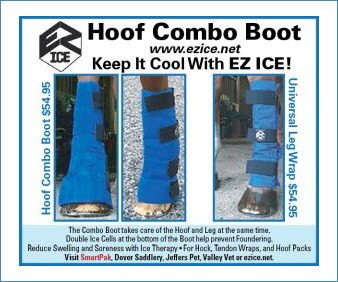 “It’s inspiring to find a trainer who is so artistic and creative and intellectual but not afraid of the grunt work that goes along with horses,” said Jessie Lochrie, a writer who lives in Brooklyn and also manages Manhattan Saddlery, New York City’s only tack store. To decompress on her days off, Jessie spends hours grooming Trystan, a Paint/Morgan cross with a background in eventing and a jump to match. About the writer: Sarah Maslin Nir is a staff reporter for the New York Times, best known for her 2016 expose on the working conditions of manicurists and the health effects they suffer which was nominated for the 2016 Pulitzer Prize. 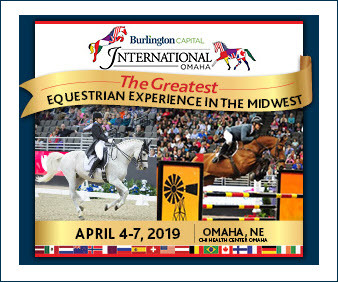 What people don’t know, is that she is a passionate hunter ring queen, owner of two Dutch Warmbloods, Trendsetter and Gold Standard, and has been riding competitively for 32 of her 34 years on the planet.